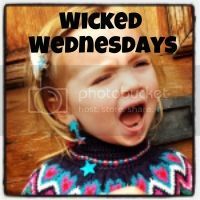 This is my third #wickedwednesdays linking with BrummyMummyOfTwo! It’s been another week of baby mischief, cruising along the settee, tables and finding the stairs…. We’ve dismantled the nest of tables H loved, all ready for moving. She’s also loved investigating the boxes… And repacking some! I think that’ll be next week’s photo! She’s been fantastic while we’ve packed, playing in her walker, playing in her cot and sitting in her chair. My favourite post this week has been “5 Reasons a Newborn Baby Makes Me Late“… This was written a few months ago (when I set up the blog), but I hadn’t published it. It has also been retweeted by mumsnet so thank you to them! Thank you everyone for your comments and for your RTs too ? Glad I’m not alone! Really not sure how long it was there… ?